Just a little side project for Halloween , will post more info later today. Mushroom Species- Mycena vampire hunter : Carnivorous bio-luminescent fungus feeds on mosquitoes, yellow jacket/hornets, and fly's by lowering tendrils with dead flesh scented sticky excretions to lure insects. The excretions then dissolve the insects as the tendrils are drawn back into the mushroom gills. This species is rare, as it only grows in the carcass of animals. Also, why does the youtube button in the forum post tools not work? 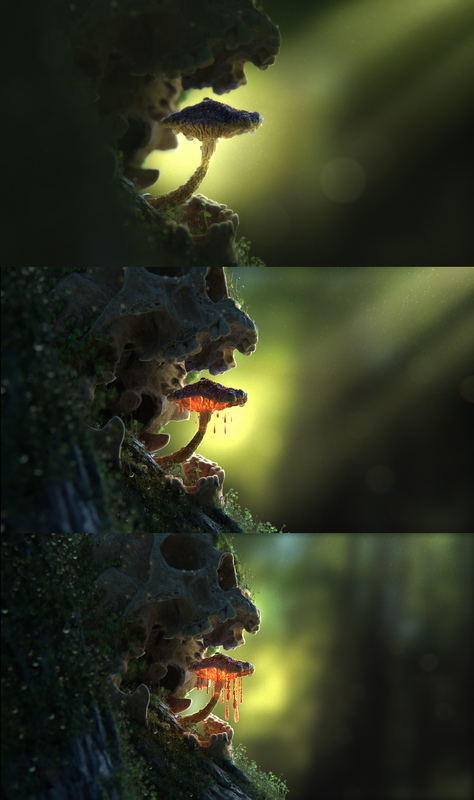 I have an updated version rendering, made a little tweaks after the first render above, will come in a few days, here are stills from it. Last edited by ambassador1 on Wed Oct 31, 2018 6:51 pm, edited 3 times in total. Modeling was modo, some procedural modeling for the mushroom, along with some zbrush. Everything else, look dev, texturing all Clarisse, the only map is the displace for the bark. The bg plate was from a photo of mine in the woods nearby. The noise issues in the gloss in the first render was caused by using an hdri with too extreme values, e.g. 1000+. After I clamped the values that noise went away. Definitely interested in seeing how v4 adaptive sampling handles the scene, along with the ultra large scale of shots at the studio. Small suggestion, would be nice if the vid wouldn't stop that fast, maybe one sec of still frame at the end to see the whole skull in all it's glory? That's an awesome piece of work! !